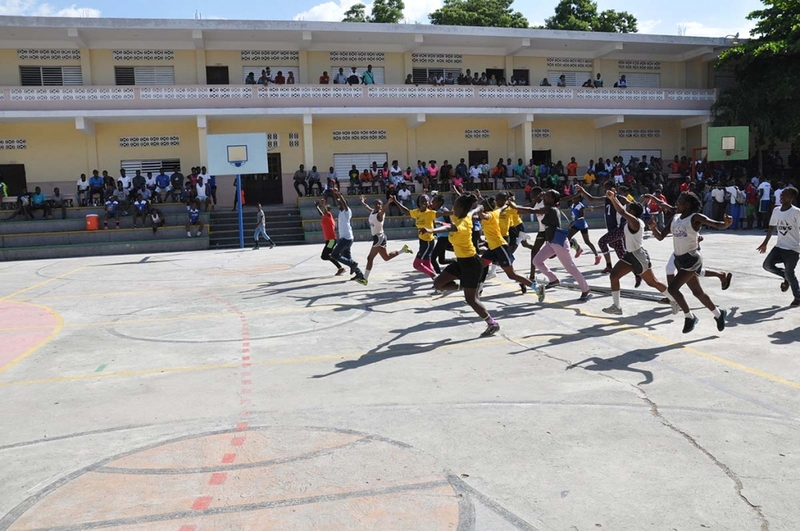 (MissionNewswire) Salesian missionaries in Port-au-Prince, Haiti organized the seventh edition of the Salesian National Games. The games, held May 17-20, brought together more than 1,000 youth from several Salesian and Daughters of Mary Help of Christians programs across Haiti. The sporting event began with an opening speech by Father Jean-Paul Mésidor, superior of the vice Province of Haiti. He encouraged young people to cultivate tolerance, a sense of belonging and team spirit. Since almost the beginning of Salesian educational programs, sports and recreation have been an integral part of the curriculum for youth. Whether formally or more informally, socio-sports programming has been a way for youth to relax, gain confidence and engage with their peers. Today, almost all Salesian programs in Haiti and across the globe have some form of recreation and in some, more formal socio-sports programs have been developed. Salesian missionaries began working in Haiti in 1935 in response to the Haitian government’s request for a professional school. Since then, Salesian missionaries have expanded their work to include 10 main educational centers and more than 200 schools across the country. The 10 centers each have a number of primary and secondary schools, vocational training centers and other programs for street children and youth in need. Salesian programs are located throughout Haiti, including in the cities of Port-au-Prince, Fort-Liberté, Cap-Haïtien, Les Cayes and Gressier. Today, Salesian missionaries in Haiti are the largest source of education outside of the Haitian government. and their programs serve more than 25,000 Haitian children. The Salesian-run Lakay Project includes five facilities in Port-au-Prince where the games were held. The project also has another facility, divided into two sectors, in Cap-Haïtien. Each of these structures was created to respond to needs of children and older youth who found themselves living on the streets. In total, nearly 5,700 minors benefit from this project, which is facilitated by 57 staff members. The Lakay project centers are each specialized for the various stages of life and to the types of assistance needed by the youth. At Foyer Lakay, children live as a family for a period of four years until the completion of their apprenticeship in a technical profession. Lakay Program for Street Children provides shelter and educational services for street children in Cap-Haïtien and Port-au-Prince. Students from the Lakay Project, as well as other Salesian programs across Haiti, participated in the games. Haiti’s economy has also been repeatedly affected by political crises and natural disasters in the last two decades, exacerbating an already challenging situation. Eight years after the 2010 earthquake, Haiti’s population of 11 million continues to face humanitarian and development challenges.